The leg yield is a useful equestrian exercise that is probably the easiest of all the lateral movements for your horse to learn and perform. Your horse is flexed away from the direction of movement and then asked to step sideways away from the pressure of your leg (right leg in the diagram) while still travelling forward. Even if you never intend to compete at dressage, teaching your horse to do some typical dressage moves will help to make it more supple, flexible and disciplined. It is very important that you do not attempt any of the other lateral movements until your horse understands the leg yield; can do it in a supple way and can go sideways easily while maintaining good rhythm and balance. Leg yielding can be useful for all kinds of situations, such as opening and closing gates when you are out hacking, or correcting your approach into a show jumping fence. Leg yielding at canter is a good exercise to use during your warm up as it supples your horse and gets him moving away from your leg. The first thing we need before attempting leg yield is a good, straight forward-going walk. This can take some work depending on the horse but let’s assume you have a good walk. To make it easier you can turn down the three-quarter line of the school and use your horse’s natural inclination to return back to the wall or side of the arena to help get you started. Remember; This can also work against you if your horse is too keen to get back to the track and you can get a hurried over-bent movement. If you have this problem you may need to try other tactics like coming down the centre line. After turning down the three-quarter line your inside rein flexes the horse to the inside. How do we flex the horse to the inside? Ask the horse to flex by gently curling and uncurling your inside hand around the reins until the horse flexes. This is all that should be needed. Do not pull back on the reins and try to pull his head around – not only will the horse object, but you are likely to cause too much bend in the neck and you’ll never get a good leg yield from there. You have enough bend when you can just see your horses eye and nostril. Try to learn how to leg yield and to perform it well. Your horse should stay parallel with the sides of the school and not trail his quarters or shoulders, the most common problems in executing the movement. In leg yield your horse is always flexing in the opposite direction to the way he is going, You must not restrict the canter, but keep it going forwards and sideways. Your inside leg should go back behind the girth, ready to be used in time with the stride and to help maintain the sideways movement. Using The Aids in Leg Yield. Taught from walk and trot first, it’s easiest to teach the horse leg yielding on the inner track as he will naturally want to return to the outer track. Turn down the inner track and flex the inside rein until the horse bends his neck just enough for you to see his eye and nostril. Once we have this bend we can begin to ask for the sideways movement. Use your inside leg a little behind the girth in time with the stride. It’s important to use the leg in the press-relax-press-relax way – a constant pressure will cause the horse to lean against your leg and not move away from it. To time your leg aid you need to press as you feel the horse’s belly swing away from your inside leg. This is the point when the horse’s inside rear leg is coming underneath for the next step forward and is the only point you can effectively influence the horse’s stride. The outside rein is held against the neck but doesn’t do anything actively. The horse will feel the outside rein against its neck and it stops him from falling out through this shoulder and diving back to the outer track which is another common problem. 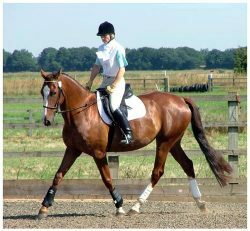 The outside leg doesn’t move from your normal riding position but can be used to ask for more forward impulsion if the walk begins to fade away. It’s much easier to get started if you have help from an instructor but if that’s not possible do try and get a friend to watch, especially from behind as you leg yield, as they can tell you how straight you and your horse are. Why Bother Learning How to Leg Yield? It’s a fair enough question to ask. What benefits does learning these movements bring to my ordinary riding? How the showjumper can make use of leg yielding. If you’ve turned into a jump a bit wrong and you are not central to the jump just adjusting the approach by turning the horse can leave you jumping at an angle. Making your correction by leg yielding will leave you square on to the jump and could save you valuable seconds in a jump-off situation. Leg yielding is the beginning of teaching your horse to listen to your leg aids and to move away from your leg when asked. It’s useful, for example, in positioning the horse at gates, moving to the side of the road whilst keeping the quarters from swinging out. Learning how to leg yield should also be fun for you and the horse and gives him something new to think about. When we move on to exercises like shoulder-in these lateral movements can be a very useful way of straightening and improving the suppleness of any horse regardless of whether you ever intend to do any dressage. They are also great for teaching the rider to use legs, hands and seat independently of each other, which can take a while to get the hang of. Proneness to lean to the side or collapse a hip will also show up in trying these movement, all of which if worked on will improve your general riding. Common Problems in learning how to leg yield. Unfortunately one of the most common problems is an inexperienced rider trying the movements on an inexperienced horse. However, very few of us have regular access to highly trained schoolmaster horses and so sometimes we have to try and educate ourselves and the horse at the same time. If you can get a lesson on an experienced horse it will be a great benefit because you’ll feel what the movement should be like which you can then aim for on another horse. As mentioned above, the diving back to the track with an over bent neck can be a problem. This is where you will need to use the outside rein a little more actively. Press the outside rein firmly against his neck to block his movement through that shoulder. If you still have trouble bring your outside leg back behind the girth and apply a strong pressure whilst moving your inside rein out sideways (not back). This should straighten the horse and stop him diving back to the track. Another common problem is that the rider is so busy trying to concentrate on their legs and hands that they forget to move their lower back with the horse’s walk and the horse slows down. Try and remember to keep going with the forward movement of the horse. The outside leg can also be used to ask for more forwards impulsion. If it all starts to go horribly wrong it’s usually best to straighten up and get some good steps on a straight line before asking again. Once you are happy leg yielding at walk and trot (sitting and rising) then you can always try it at canter. Don’t think this is the preserve of expensive dressage horses. As long as your horse has a balanced canter there’s no reason not to have a go. A horse I ride, a stocky cob type, can perform some nice steps of leg yield at canter. This is something that can usefully improve the overall canter pace as the horse will have to be thinking quite carefully about where he puts his feet. We aren’t going to win any prizes for it but it’s fun, a real treat when you get it right and feel it happening and I’m sure it gives some interest and variety to my horses work.